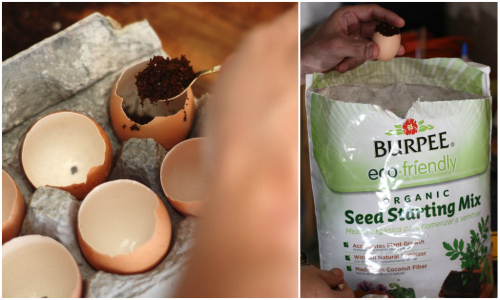 How To: Plant Seeds Using Eggshells | mizzeliz – working for you..
We were excited when our Sprout Robot alert went off that it was time to start broccoli seeds indoors this weekend for our zip code. With the move and being in the midst of colder months, we are seriously lacking in the gardening department, except for our avocado sprouts(which we have an exciting update on coming tomorrow). 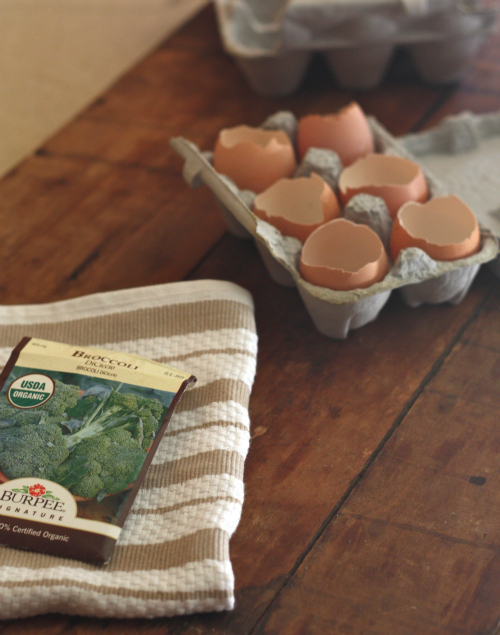 We located our organic broccoli seed packet from last year’s garden and hit up our gardening Pinterest boards (mine & hers) where we’ve been collecting ideas for creative planting all winter. 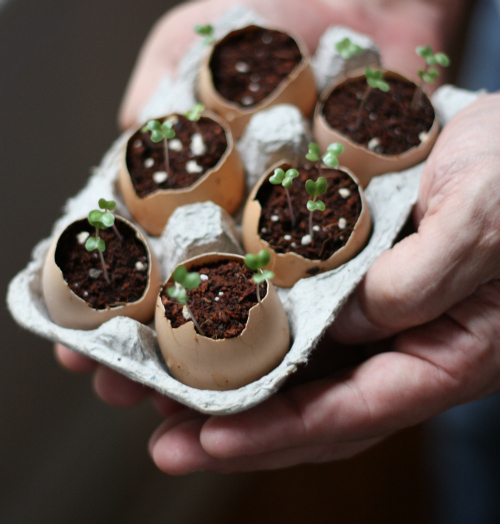 We had one particular idea we’d seen pinned in mind and couldn’t wait to try for ourselves — eggshell seed planters. 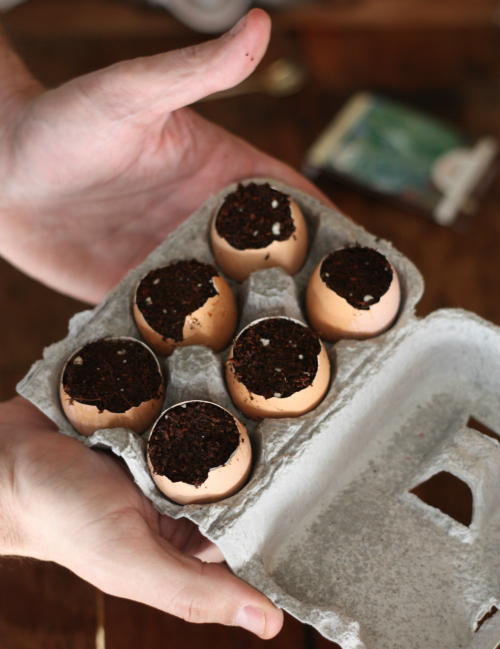 Evidently, eggshells make the perfect size seed starters, are natural, biodegradable, can be planted directly into the soil after being cracked a little, and supply nourishment to the plant and surrounding soil (not to mention they’re free). 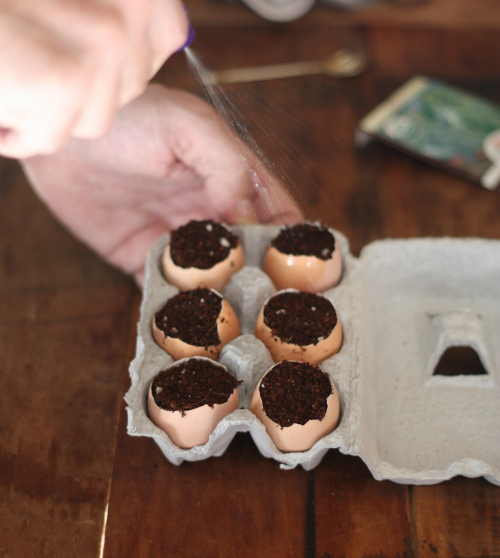 After saving the shells from this week’s eggs, we set out to make our eggshell planters. Today we’re sharing just how we went about it for those of you that might also want to give it a whirl as planting season starts up! 1. 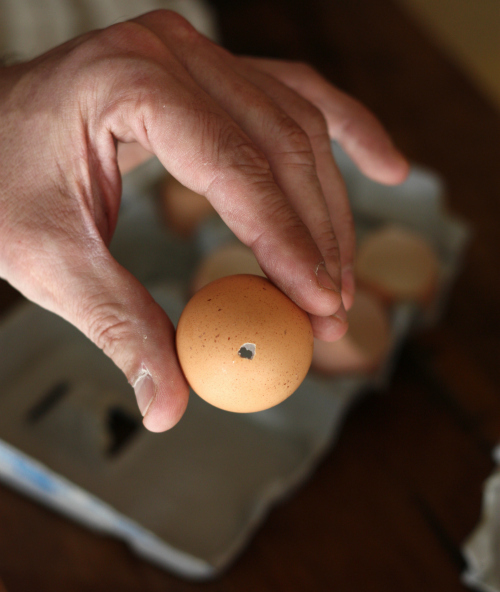 When cracking the eggshells, slice the top part of the egg (narrower end) with a sharp knife and gently pour the egg from the opening for use. 2. 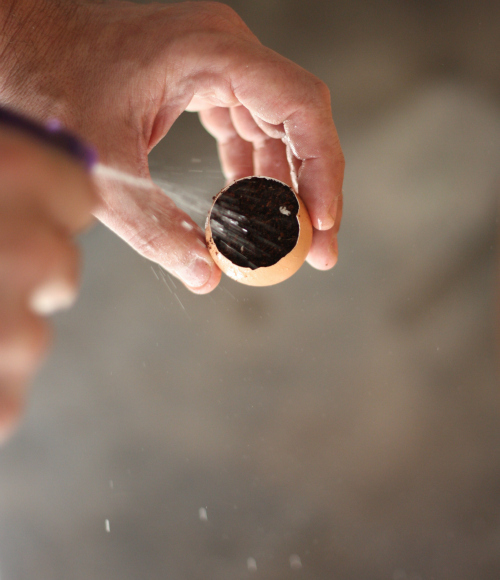 Reserve eggshells, rinse well inside and out with water. 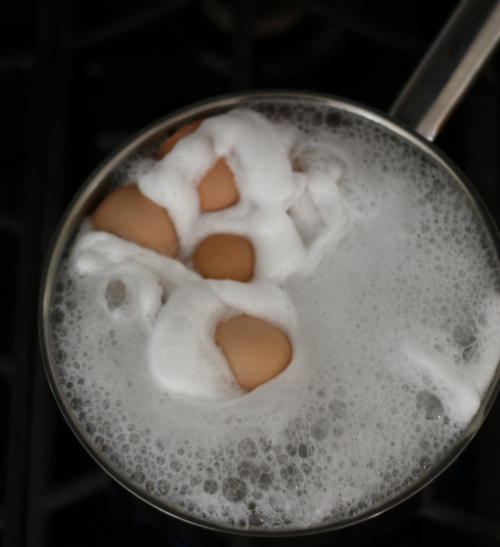 For extra caution, we decided to boil the shells for a few minutes to make sure all traces of egg were cleaned out. You can see how the shells foamed up a bit, letting us know we hadn’t gotten everything out with the simple rinse. 3. 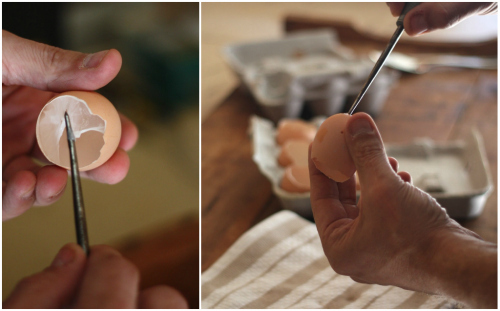 Rinse eggshells again, and gently place them back in their egg carton to dry. 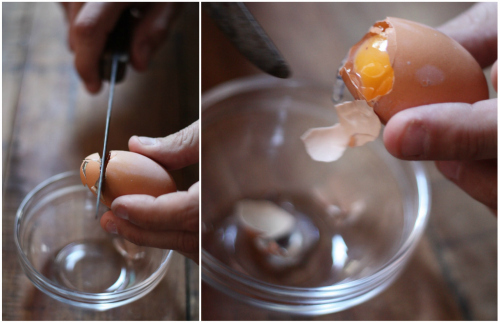 Once dry, gently chip any rough edges of the eggs to desired opening size. 4. 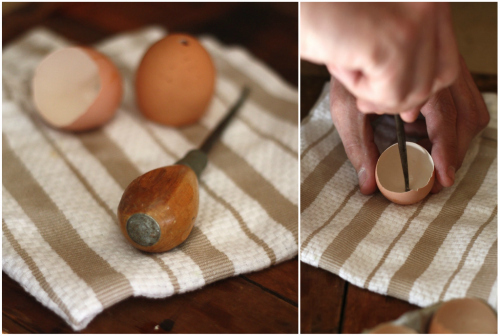 Use awl, or wide sharp needle to gently puncture a single hole in the base of the eggshell. This will create a drainage hole for your egg planter. I punctured our shells from the inside against a thin kitchen towel, then reinforced through the back-end to ensure proper drainage could take place. 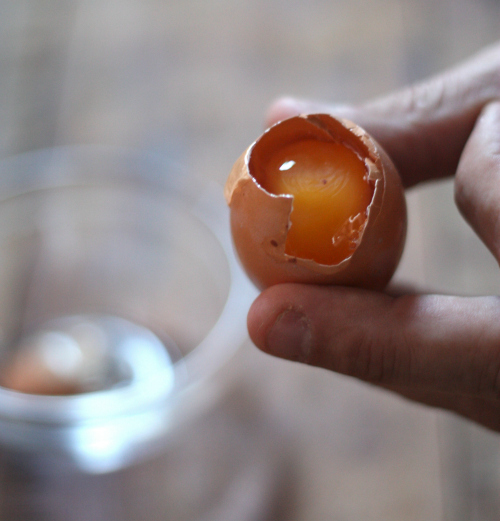 During this step, you may have to remove parts of the thin membrane alongside the eggshell. 5. 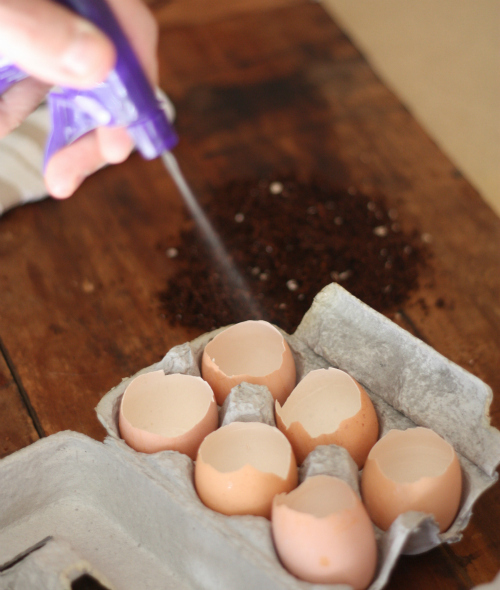 Place eggshells back in carton and spray gently with water using your spray bottle. 6. 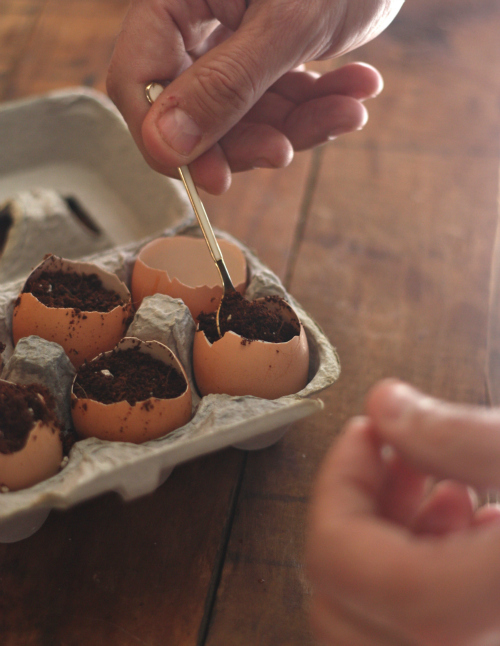 With a small spoon, gently scoop planting or potting soil into eggshell to fill (we went withBurpee organic seed starting mix). You may want to gently shake egg to even out soil. 7. Plant seeds according to directions to determine depth and any other special care. 8. Spritz again gently with spray bottle and place in well lit area with sun indoors. 9. Water plants accordingly, watch and wait for your seedlings to sprout. 10. 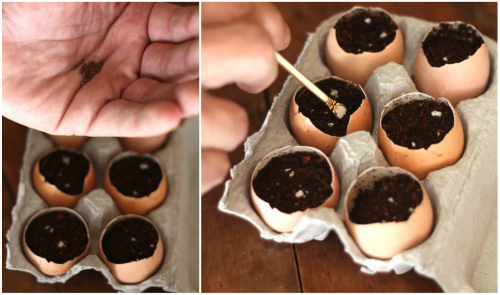 Once sprouts have grown large enough to transfer, thin them out and plant directly into the ground or larger planter after gently cracking the eggshell around them. 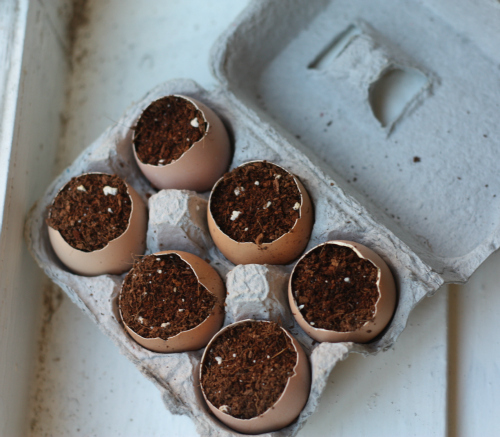 The roots will grow beyond the eggshell into the soil, the shell will continue to provide nourishment to the plant and surrounding soil, and will eventually will biodegrade. 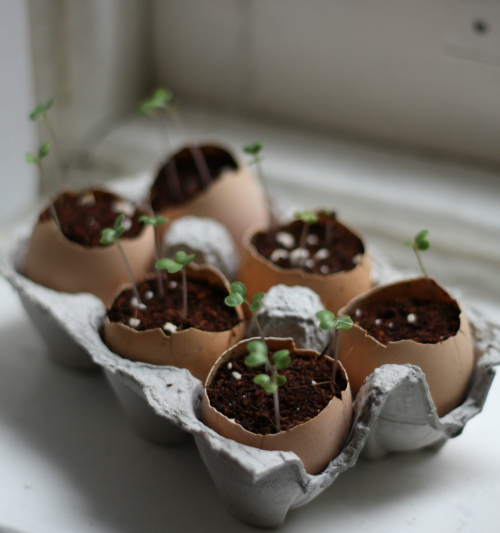 It took our seeds just a few days to sprout up in their eggshell planters — much faster than they have in the past with plastic containers we’ve used. We’ll keep you posted on the progress of our little broccoli plants and hope you’ll let us know if you give it a whirl! If you’re as eager to try out this project as we were, plug in your zip code to Sprout Robot and see what seed varieties are ready for indoor planting in your area.